The Clarisonic Plus has a brush head that is specially designed to work on the skin on your body – and as the days get warmer, it’s definitely time to start paying attention to the skin that will show it short sleeves and shorts! Everyone knows that the Style Chicks are completely addicted to their Clarisonic Brushes, so the good folks at FlawlessFace.net let us know about this great deal! There is a Drugstore 15% off coupon for the Drugstore anniversary sale. The 15% off link can combine with Drugstore dollars for extra savings. Drugstore.com has 15% off for their anniversary valid until 4/14. One good item to use this Drugstore.com 15% off coupon is the CLARISONIC Skin Care Brush Limited Edition Pink, Breast Cancer Awareness + 2 oz Cleanser for $166 shipped. The Clarisonic Brush is a great tool to gently exfoliate for older skin, sensitive skin, and even acne prone skin. I’ve been feeling a little Goldilocks-esque lately when it comes to facial cleansers. Some are really moisturizing, but take too much scrubbing to wash off. Others wash off easily, but don’t do a thorough job when it comes to taking off all my makeup and sunscreen. 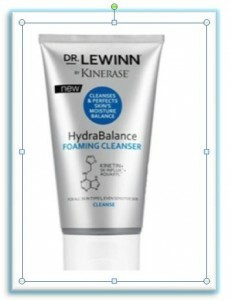 And then I found Dr. LeWinn by Kinerase HydraBalance Foaming Cleanser. Based on past experiences, I generally shy away from foaming cleansers since the ones I’ve tried tend to be drying. However, I have used Kinerase products for years now, so I had hope that their mass market line in connection with Dr. LeWinn would live up to it’s claim of being not just non-drying, but hydrating. And it does. My skin is soft, hydrated, and bright after cleansing. And as far as taking off makeup? It is exceptional. No scrubbing needed, it just takes everything off on both face and delicate eye skin. I’ve been using a liquid liner lately that is fabulous, but it is pretty tough to take off at the end of the day. Hydrabalance Foaming Cleanser takes it off easily and with no tugging. Yay! HydraBalance Foaming Cleanser is soap-free, which will make your dermatologist happy (mine was the one who turned me on to the Kinerase line in the first place years ago). But I can’t say enough how well it cleanses while it treats the skin with great ingredients like Kinetin (which is in the whole Dr. LeWinn by Kinerase line in the same amounts as the regular Kinerase line). I’ve tried products from both the Kinerase line and other lines that contain Kinetin, and they are always so soothing to the skin. It encourages cellular turnover without irritation – a great alternative to retinoids. It also contains SK-Influx to protect your skin’s moisture barrier, and Aquaxyl to hydrate the skin. All in all, a great way to start your skincare for the day and end it at night. In an act of sisterly love, I let Lyn use the cleanser, and her comments were interesting – she said that she’s never used a foaming cleanser that felt soft. She hit the nail on the head – there is something that feels kind of rough about most foaming cleansers, but HydraBalance Foaming Cleanser isn’t that way. It is gentle, soft, and luxurious feeling. I’ve been using it with my Clarisonic – it feels like a spa cleansing! I’m pretty thrilled with this cleanser. We’ll be reviewing other products from the Dr. LeWinn by Kinerase line in the upcoming weeks (spoiler alert: Skin Tone Perfecting Serum is so effective it’s kinda spooky), and I will purchase HydraBalance Foaming Cleanser in the future. And since my derm loves the regular KInerase line, I can’t wait to tell her about this very affordable and very effective new line! Find Dr. LeWinn by Kinerase HydraBalance Foaming Cleanser at Walgreens for $10.49. This works best if you have a prescription retinol at home (Retin-A, Retin-A Micro, Renova, etc), but any cream that has retinol in it will do. Wash your face and wait about a half hour. Apply the retinol – if you are using Retin-A and typically use a pea-sized amount, and use a little extra. Let it soak in for a few minutes. The add a deep hydrating mask or cream over the retinol – we like CeraVe Moisturizing Cream or Caudalie Vinosource Moisturizing Cream-Mask Face and Eyes. To make sure that your skin is more dewy that flakey the next day, really slather on the moisturizer. Leave it on overnight, and wash it off in the morning (try using a Clarisonic for extra smoothness). Your skin will be glowing and bright all weekend long! Now, obviously retinols are a long-term skincare commitment, but if your skin needs a little extra boost after a long week, this mask does the trick!